Thanksgiving placemats can spruce up your holiday table and give your table setting the extra touch needed to make it a special dinner. Deciding to use placemats for your Thanksgiving table setting may be a style choice or possibly an economical decision. You can usually purchase placemats cheaper than you can a tablecloth. Another consideration may be to use placemats along with a favorite tablecloth. The placemats can add color and design while also protecting your tablecloth and tabletop. Another option is to use placemats with a matching table runner for the holiday. The determining factor in how much your placemats will cost are the fabric choice, pattern design and of course, the number of placemats you need. You can often find good deals when you purchase larger quantities. There is a limitless variety of fabric choices for placemats that range from thickly woven to fine linen. You may want a cotton plaid in fall colors or opt for an easy-care vinyl placemat for use during the holiday season. If you have a Thanksgiving centerpiece for your table, then you can use this as a guide for the colors you want in your placemats. 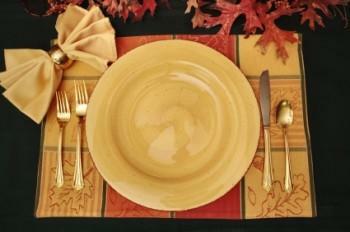 If you have a special Thanksgiving china pattern that you use, then you may decide to go with solid-colored placemats. Consider the individual place setting and how your table will look once it's completely set for the meal. Simple oval placemats may be an ideal choice for a large table with a formal silverware place setting. Rectangle placemats allow you to have a larger place setting than an oval one. You may want to go with a shape that's less formal or traditional. You may decide that a scalloped-edged Thanksgiving placemat is more of the style you prefer. If you feel non-traditional, then consider taking your fall theme further with a leaf, pumpkin, turkey, or cornucopia shaped placemat. There are many free patterns available online if you're a seamstress and prefer to make your own tablecloths. You can be very creative with embellishments and fabric choices that you won't find in typical linen stores or Web sites. You can even personalize each placemat for each member in your family and give your Thanksgiving celebration a unique style. Take advantage of the colorful fall leaves and take a walk through the woods collecting several different ones. Tear off two sheets of wax paper the size you want for your placemats. Once you and your child have selected the leaves you wish to use, arrange the leaves onto one of the sheets of paper. Place the second sheet of wax paper over it, careful not to disturb the leaves.Using an iron set on low heat, seal the wax paper together. You'll want to trim the edges. You can also use various trims around the edges if you prefer. Create scalloped edges out of construction paper and place in between the wax paper before sealing to create a finished look. You can add other things in between the leaves if you wish such as glitter, stars, confetti cutouts, and even crayon shavings that will melt under the iron's heat. Your child will enjoy using her placemats during the family meals. Creating a memorable Thanksgiving table setting is easy with a little creative thinking and breaking out of the normal mold. Whatever placemat design you decide to use, you can be sure that your family will have a unique dining experience with the right Thanksgiving placemat.